Mark the date: 12 years together as a couple, nine years of marriage, and I finally introduced a new woman into my household. I held out as long as I could. Now, we have a cleaning lady. My husband grew up with someone coming to clean his childhood home. Also, a great majority of my friends have someone come clean their house now. Although my husband has advocated for a cleaning service since we were engaged, I just couldn’t bring myself to make the call. Why not? A part of it was feeling pride in keeping my own household. My late grandfather from the “old country” described me as a balabusta and I took a lot of pride in this designation. Therefore, I do the majority of cooking and spend more time than I care to admit searching for the healthiest recipes to serve to my family. I scour circulars for the best deals at the grocery store. I bake challah, baguettes, bread bowls, cinnamon buns, croissant and pain au chocolat from scratch (OK, not everything is super healthy). I quilted blankets for our master bedroom, and my 4-year-old twins’ actual twin beds. I love house projects resulting in creating a cozy and inviting environment. I like feeling as though “I got this” when it comes to keeping house. When it came to cleaning, I could always find the time. I couldn’t justify the cost of a cleaning service when I know how to wipe down countertops, dust, vacuum, sweep and mop with the best of them. Admittedly, my house is not historically spick-and-span, but we’re not slobs or hoarders. It was presentable and making rules like food stays only in the kitchen makes a world of difference when you have small children. Fast forward nine years and three kids later, and while I could find the time to give my home a deep clean, the difference now is wavering desire to clean. Yet, my wish for a clean home has conversely increased. 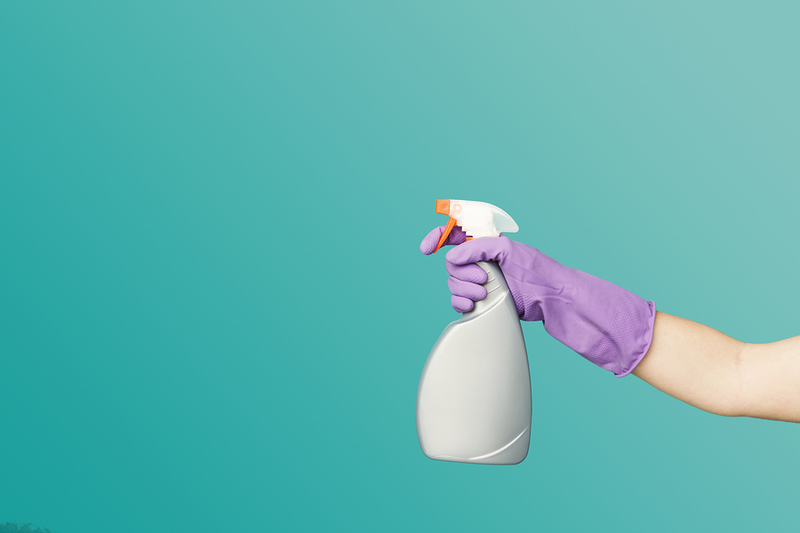 For better or worse, now when I have downtime, I want to let go of the nagging feeling of wiping down kitchen and bathroom surfaces with bleach-like cleaning products. Now I want to spend my free time with my family, friends, or enjoying one of my hobbies (like hiking or biking). I do not want to feel like dust bunnies are mocking me or hear crumbs between the couch cushions calling me to be vacuumed. My husband is a huge help domestically and does his share of laundry, the vast majority of dishes and toilet-scrubbing. But like me, he likes the finished product of a clean home, but not the time and effort required. With age, our time is more valuable than the cost of hiring a cleaning lady. So last month, I got a recommendation from a friend and welcomed a cleaning lady into our home. She comes once a month to do a deep clean and complimentary de-spiderizing of the basement (it’s in our contract) and I love it. Once a month, the smell of cleaning products greets me as I walk into an exceptionally clean home after the often frenzied pre-K and afterschool care pick-up. It feels really good. Truth be told, I am beginning to feel like a dolt for waiting so long to make the leap. But I’ll pivot and say I appreciate the end product so much more because I have held out this long. The best part is my 6-year-old and 4-year-old twins now maintain a tidier bedroom! Now they see the benefit of putting away the toys in their rooms. I wish I could say I taught them this, but credit goes to the cleaning lady. She has brought so much goodness in to my home. Balabusta or not, I’m a happy mama.